River mouths worth a look. Winter conditions have kicked in this week with frosty, misty cold starts and the afternoon sun disappearing before 4pm so it seems we are into my favourite time of year. Cold frosty mornings are hard to get up to but itÂ is well worth the effort when the mist is rising of the lake or you ar removing a hook from the lip of a silver bullet in the Tongariro. The days after these mornings are always clear and sunny, not necessary hot but a pleasure to be outside wondering the banks of one of our amazing water ways. 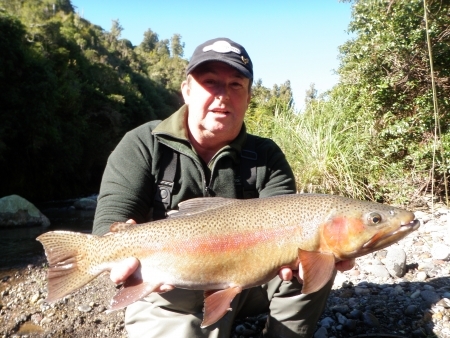 Fishing has been red hot at some of the river mouths over the past two weeks fishing boobie style patterns or traditional flies like Red setters or Green rabbits. The TT has been fantastic and the quality of fish that have been coming out truly have been some of the best fish that I have seen for some years. This mouth seems to be fishing well all day but really takes of in the dead of the night around 10pm. 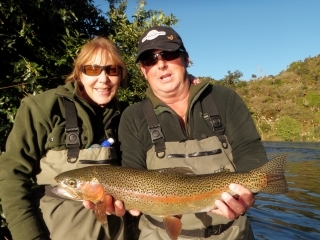 While fishing during the day you should expect the fish to turn up in waves and then go dead again for an hour before the next hook up , it’s just a matter of being in the right spot at the right time with your fly in the water. 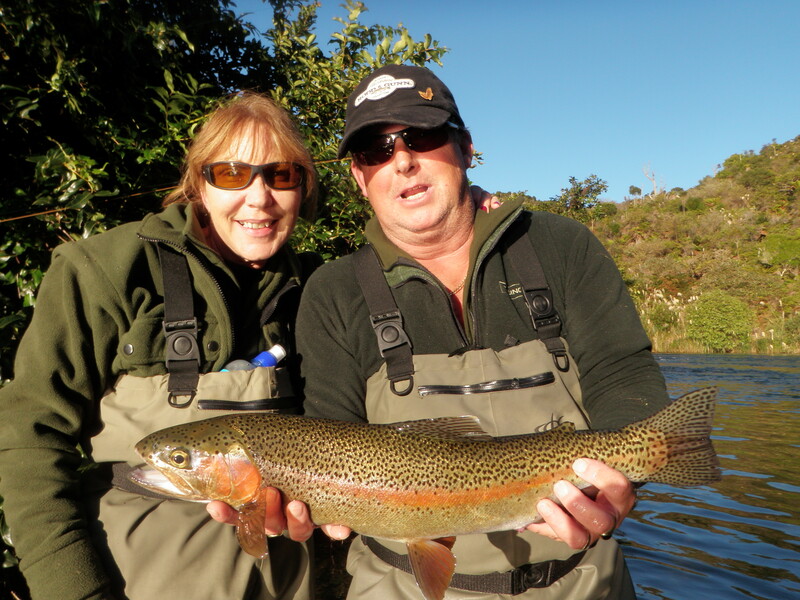 Glenn Good fished here on Sunday afternoon and landed a nice silver hen which he returned after landing but also was lucky enough to witness a 8lb Rainbow landed -serious fish!!. The nights are still pretty dark at the moment with the new moon phase so fishing should be productive for the next week on most river mouths while conditions suit. It gets bitterly cold out there at night so make-sure you get the neoprenes waders out and rug up with beanies and scarves as it an be a long time between fish when you are cold. I guided 5 half days last week with very different results which I am sure will please Ross as every Day I guided on the Tongariro we caught good numbers of trout but as soon as another river was involved fishing was hard. Other rivers which were involved were the Waytoohardanuie and the Hine which are both very good rivers at the right time but man did I struggle on them last week. They are rivers which you have to be there when the fish are running through to be in with a good chance of getting good sport otherwise it an be very hard. With water levels low in the Hine fish that are entering seem to be running through very quickly not giving the angler much of a chance to get into them. The lake has been fairly calm over the past couple of weeks not giving the Waitahanuie the westerly winds it needs to push fish into the system, therriver looks perfect and I am sure with the next band of crappy weather we will see some groups of trout enter. I will never be an expert on this water but it sure doesn’t help when every pool on the upper river on this particular day was being poached with young guys fishing with lumps of fish eggs (roe). 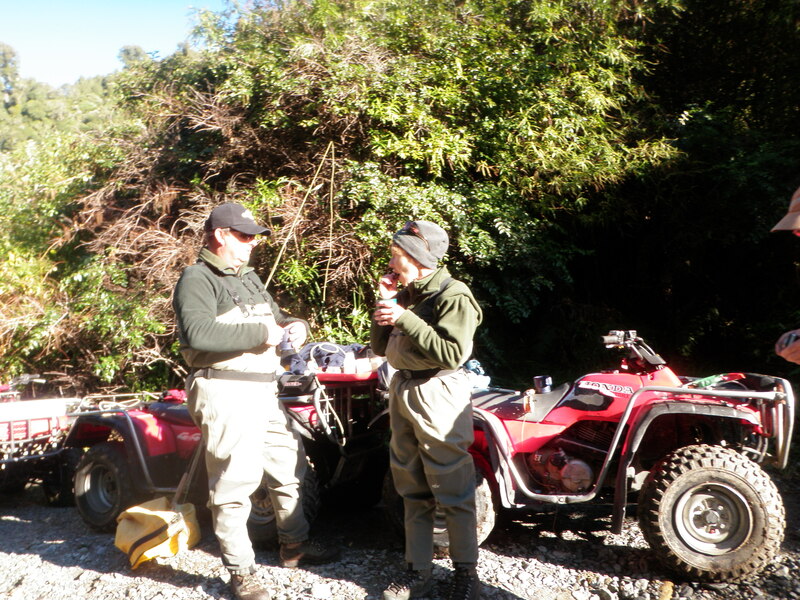 It is also a terrible look for my clients when I have just given them the talk about how precious our fishery is and only fly fishing is permitted within Taupo rivers this putting everyone on a level playing field. I made the call to DOC and reported the illegal activity which they promptly acted upon the best they could which is great to see. 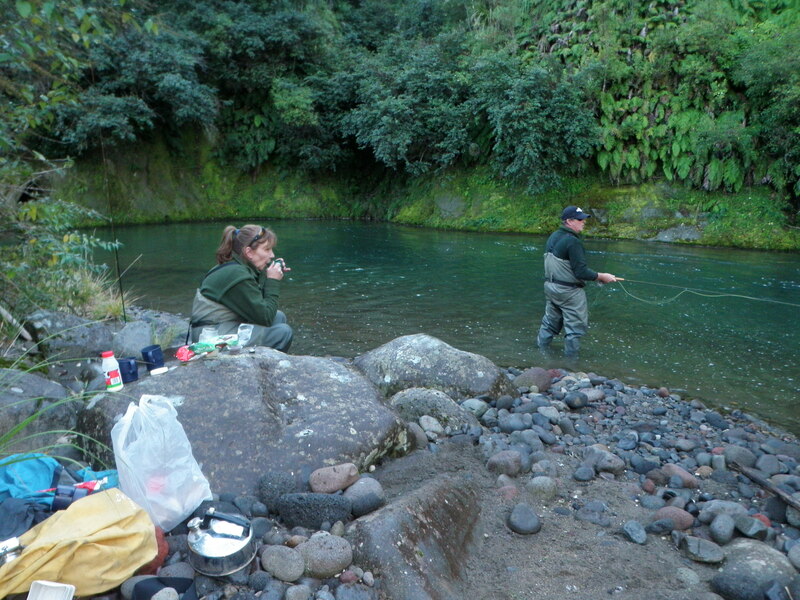 The Tongariro is a little up and down from day to day but if you keep on the move and change your fly every 5 minutes to something new you will be rewarded with a few fish. I am still fishing summer tactics in here at the moment as the level is very low and the conditions are not quite ready for the 5mm bead and the glo bug dredging the deep holes. I know I have said it a thousand times but we really need some rain in this river to flush out the summer slime and get the fish moving in from the lake. The lake level is horribly lowÂ and is very obvious when driving around the edge of it, this is the lowest I have ever seen it. My most productive pools over the past week or so have been Judges, Big Bend and the Cicada pool. My favourite fly’s have been Quasimodo’s, Green CaddisÂ and the Prince nymph all tied in either a size #14 or #16 and all available from PeterÂ at Taupo Rod’n Tackle on Tongarrio street. Angling pressure has been low but there are most certainly a few more anglers getting about the place in search of silver fish soÂ I am predicting this winter will be a busy one on the Taupo rivers. As I said last week the best fish to be had at the moment are from the backcountryand most anglers which are making the most of the last few weeks of open water have been doing well with fish getting ready for spawning. These fish are in real good condition and have alot of energy to burn resulting is some memorable battles. 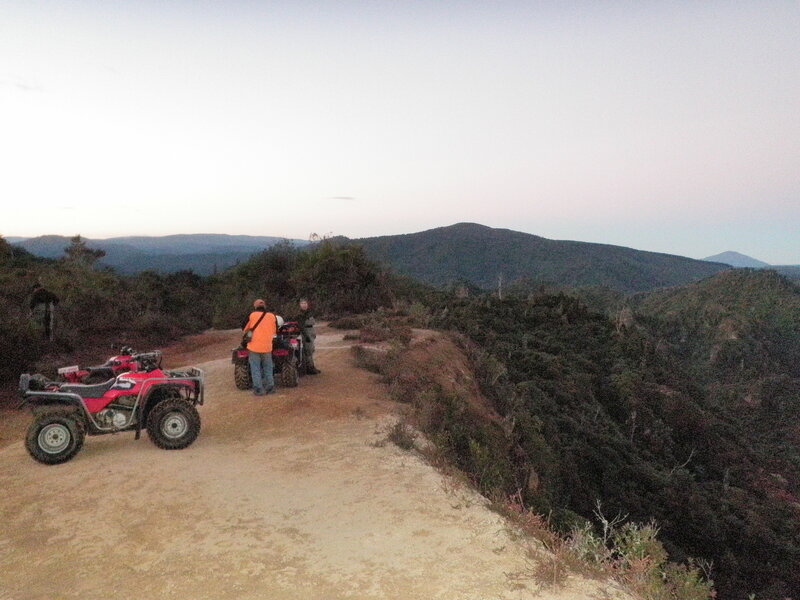 Glenn and Teresa decided they might like to try the quad bike trip into the back of the Wanganui before the river shut so we headed in there early yesterday morning and had a great time. The day could not have been any better with a cold start but clear sunny day which is perfect weather for this water. Scenery in hereÂ is amazing and you feel like you are in Jurassic park with high mountains, old trees and ferns and no sign of another angler or person. A moderate level of fitness is needed in here as the walking an be tough and the wadingÂ is very slippery at the moment,again the river could do with a little fresh water through it. Fishing we found slightly challenging with only 6 fish hooked up and 5 to the net this could have been due to the colour of the water. I think that they may have been flushing the canal and this resulted in a green tinge to the deeper pools which we usually do very well in. I find backcountry rivers to be the opposite to Taupo rivers and dont fish very well with colour in the water-for what reasons I have no idea?? Despite having this against usÂ we still managed some great fish ranging from 4 to 6lb with heaps of fight in them. The first fish Glenn caught had some real fight in himÂ and had me crossing back over the river and very nearly getting all the sandwiches wet while trying to net the bugger at full stretch. This trout was a well coloured up jack ready for a female to do her thing and weighed about 5lb-a small Quasimodo proving his downfall. I was shocked when I managed to spot a very nice Brown feeding from the surface in a backwater of a pool and wasted no time swapping the nymphing rig for a small Para Adams. This fish was cruising about the pool slurping of the surface every minute or so and I knew with the right cast on his beat he would eventually pick it up. It only took one well presented cast and he turned and gulped the little wee dry which meant Teresa was into a good fish for the first time today. 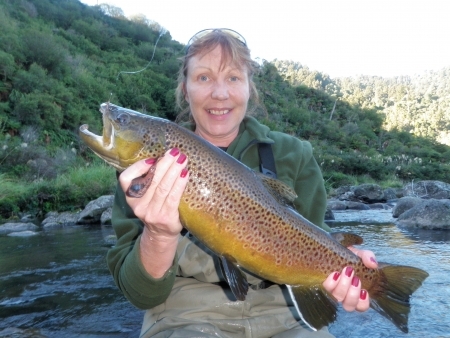 Teresa has caught heaps of troutÂ over the years and made sure that the right steps were taken to ensure that this beauty made it to the net to get his photo taken before a quick release. All in all a good day in the backcountry enjoying fishing, scenery and some really exciting quad biking with awesome views. It was a long day which spread over 12 hours but when you are in such a special place thereÂ is no point rushing it.